A dozen or so blacksmiths operate on a stretch of Adeline Street in West Oakland. 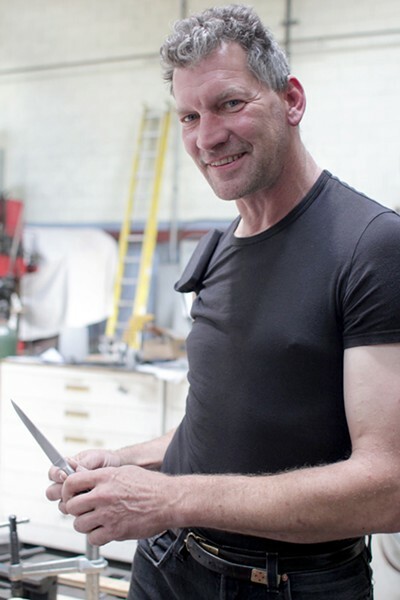 Justine Quart Jeff Pringle has been making knives since the Eighties. Dilapidated factory buildings are the most obvious remnants of Oakland's industrial past, but step inside the unassuming warehouses along Adeline Street and you'll feel like you're entering Thomas Edison's workshop or the pages of a Jules Verne novel: Many of these buildings are full of blacksmiths — surrounded by otherworldly sculptures, swords, and chandeliers — working in studios and tucked-away artist spaces. Although hammering hot metal holds obvious attraction to certain segments of the Burning Man community, the East Bay's blacksmithing history stretches back to the late 1800s when the construction of railroads helped develop Oakland into a major manufacturing hub. Today's smiths see opportunity in the city's affordable warehouse spaces, and are quietly reviving the city's craft heritage. At the helm of this thriving community is Jon Sarriugarte, along with neighbor and fellow blacksmith James Austin. Both own spacious studios on Adeline Street: Sarriugarte's one-acre playground is full of vintage machinery, glowing forges, and skylight-illuminated metal scraps. During the week, they pound out their livelihoods by working with rods of twisted iron and sheets of gleaming steel. "It's like clay once you get it hot; you can form it into any shape," Sarriugarte said. "When you realize that power, it's fun to play with." Inside Sarriugarte's blacksmith and artist studio (a former cheese-making factory), a fire-breathing serpent is slowly coming to life. Sarriugarte and his assistants coax steel into a reptilian tail, both elegant and primitive. The soft-spoken Sarriugarte, who also owns metal furniture company Form and Reform, first started working with metal while attending junior high school in Boise, Idaho. Upon moving to the Bay Area to work in the health-food industry, he started collecting junk and repairing items found in trash bins and at flea markets. But it wasn't until meeting Austin and connecting with the California Blacksmith Association in 1989 that he started seriously honing his craft. "At that time there were a lot of gentlemen who were older and retiring," he said. "A bunch of hippies got this resurgence of interest in the craft industry and found them to teach us blacksmithing." Since those early days nearly 25 years ago, many of the original teachers have died. Sarriugarte and Austin are the two youngest pupils from the group who continue smithing today. Beginning his career in San Francisco, Sarriugarte realized early on the economic practicality of creating useful objects like tables and lights. He began making furniture and selling the items at trade shows, eventually employing a crew of ten people to assist in production. Despite a bustling business, rising rent prices during the dot-com boom pushed his business out of San Francisco, and West Oakland was a natural choice. "West Oakland is right across the bridge," he said. "The weather is much better here and there's more freedom to do what we wanted. Word got around. Now we have kind of taken over." But after 9/11, the economy plummeted, and Sarriugarte's business also took a dive. Downsizing his operation to just one employee, he started building elaborate "art cars" to take out to the Nevada desert for Burning Man. The press coverage of his intricately moving sculptures ignited new business, and he was able to expand his shop to a handful of employees and volunteers. These days, lighting is the main focus of his commercial work, generating $150,000 in sales this year so far. Sarriugarte specializes in large, six-foot-plus-diameter lights that cost anywhere from $4,000 to $16,000, and more. Earlier this year he designed fifteen products for Restoration Hardware, and he's currently working on a piece for Starbucks, which will take three weeks to complete. But business isn't as lucrative as you might think. "Unfortunately, for craftspeople, you don't get rich making objects," Sarriugarte said. "But that's changing." A greater appreciation for items made to last has allowed the Oakland blacksmith community to become more economically sustainable, he said. Just on the seemingly deserted Adeline corridor, Sarriugarte estimates that between twelve and fifteen smiths are working full-time, including his friend Austin. James Austin, who resembles a bespectacled scientist, is the owner of Alchemy Metalworks and has been working with iron for about thirty years. He has long been fascinated with understanding the process of creating traditional blacksmith products. After earning a master's degree in chemistry at UC Berkeley in the 1980s, he left the East Bay to take an apprenticeship in Bavaria to learn centuries-old European smithing techniques. Upon his return to the Bay Area six years later, he joined up with another blacksmith in the Bayview neighborhood of San Francisco. After working ten years in the city, the opportunity to purchase space alongside a larger community of fellow craftsmen drew him to the East Bay. "Oakland is welcoming to the handwork community that got kicked out of San Francisco," Austin said, adding that "Here we are seen as contributors, not as a nightmare neighbor. San Francisco was losing their artisans and Oakland was gaining them — I wanted to ride that wave." Inside his bright-blue warehouse on Adeline Street, Austin focuses his work on recreating Viking axes. Austin picks up a particularly lethal-looking weapon from his collection to show off its unique construction: its long handle looks like a prop from a Scandinavian heavy metal show and the blade was shaped from one block of metal. Customers from as far away as New Zealand have bought Austin's axes, but the majority end up in private displays or in a historical-re-enactor's weapons repertoire. "Vikings are very hot these days," Austin said with a grin. Austin and his studio mate, Jeff Pringle, ensure historical accuracy in their works by investigating the composition of ancient artifacts from antiquities purchased from Europe on eBay. But Pringle takes it one step further. Frustrated with the steel available on the market, he decided to experiment with smelting his own metal, collecting black sand at Ocean Beach to create a high ore content. The result of his experimentation is evident in a blade that appears to be embossed with decorative swirls. The Art Deco-like effect happens naturally as a result of how he refines the metal. Not just satisfied with making the blade from scratch, Pringle also creates the smooth wooden hilt of the sword from dead ironwood trees he finds in the Mojave Desert. He says that by making the object entirely by hand, he forges closer ties to his art and gains a fuller understanding of what it was like to be a traditional craftsman. And there is renewed interest in both purchasing and learning how to create handmade objects like his knives and swords, he explained. "People are realizing we've forgotten what it means to be human in some ways," he said. "Having a television and having an iPhone is nice, but we used to do more then that."